High Five is a follow up to our award winning, global hit redemption game, Speed of Light, specially designed for a younger audience. This kid-sized version offers the same fun and physical game play to the youngsters in your arcade. Attractive and exciting for kids, easy to play, low cost and practically maintenance free! Just follow these simple tips to keep your game running at its best and your younger guest coming back again and again. Kids love winning tickets and they want as many as possible. The operator adjustable settings P08 & P09 allow you to set the type of bonus for players who beat the high score (No bonus, Credits, Tickets), as well as the number or extra tickets won. Your High Five comes with stickers for the player console to display prize values to the player. Be sure to give your younger guests plenty of chances to earn tickets and take home a handful of prizes! Game time is adjustable, but we recommend 30 seconds as this is a good balance between gameplay value and leaving the player with enough energy to play again. Whether you have a large game room or a limited amount of space, the small footprint of High Five allows the game to be easily placed almost anywhere in your facility. We suggest creating a theme area for kids to keep them engaged and entertained. Pirate Battle, Choo Choo Train, Princess Castle, Piñata, & Shooting Mania. 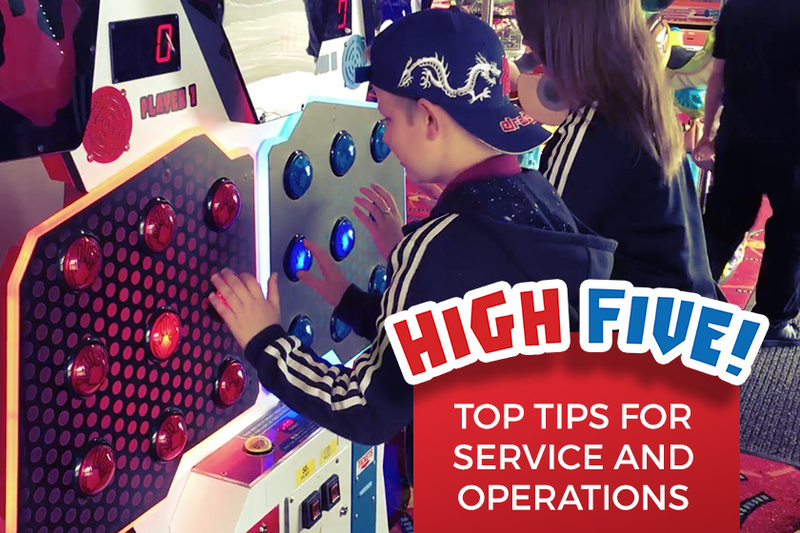 The playfield buttons get a lot of hard use from your energetic little customers, so it’s important to regularly check that all the button lamps and switches are working correctly through the ‘Input and Output Test’ in the operator menu. Stay on top and replace any globes, micro switches or buttons that are not functioning properly. It’s always a good idea to keep a few extra buttons on-hand to make sure your High Five doesn’t miss a chance to earn you revenue. Contact our parts department to place an order. Regularly dust and clean the external cabinet areas using a soft water-damp cloth and mild soap. Check for blown lamps and replace as required. Check that all LED strips are functioning, and repair as required. Regularly dust and vacuum the interior of the cabinet, taking care to remove any objects that may have fallen in. High Five can found at all Round 1 locations as well as 100+ Chuck E. Cheese’s across the US, so find your closest location and go see it in action! High Five is a great addition to any family entertainment venue, get in touch to order yours today. Brochures for download, manual and drawings for game room planning can be found here.